What in the world does hydroponic mean? Home DafaultThe Farm Dirt BlogAround The FarmWhat in the world does hydroponic mean? Traditionally, when we think of growing vegetables, there is dirt involved. Or soil, to be more precise and scientific. Fertilizer and water are added to the soil where a plant is growing, and the plant’s roots absorb the nutrients and grow grow grow! This is the method our farmers use for the vast majority of our vegetables here at Bartlett’s. But last year, Farmer Dave got creative and set up a neat system for hydroponic growing. What’s that you say? Hydroponics? Hydroponics is a method of growing plants in a soilless medium, or a water based environment. Hydroponic growing uses mineral nutrient solutions to feed the plants in water, without soil. There are several methods to do this, and Dave has set up an NFT or Nutrient Film Technique method. This uses a low volume constant flow of fertilizer water for the roots to absorb. The nutrient solution is returned to a large holding tank where it is pumped back out onto the benches where the plants are growing. In the greenhouse where this occurs, we can control all the environmental factors involved allowing us to have optimal plant growth. 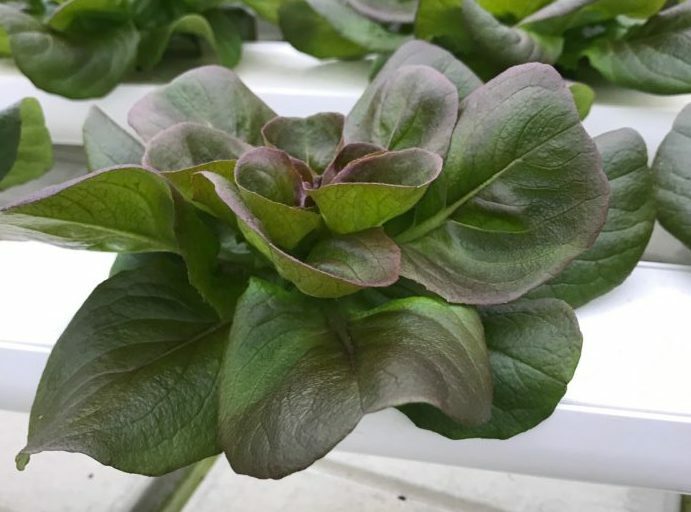 The nutrient solution is monitored by computer sensors and the plants receive the precise amount of trace elements and minerals required to grow the most delicious, crisp yet tender basil and leafy greens I have ever eaten.